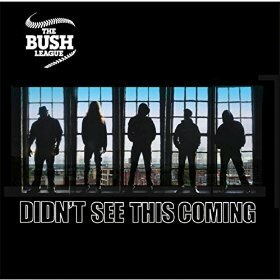 I just received the newest release, Didn't See This Coming, by The Bush League and it's another smoker! Like their first release, ”Can of Gas and a Match” this release is gritty, raw and bluesy. This release is live and gives The Bush League a chance to stretch out a bit and I think that it pays off in spades. Opening with Hearse, a rambling blues with trace clues to Govt Mule, this track has a really nice underlying bass line by Royce Folks, super vocals by JohnJay Cecil and wild frenzied guitar work by Michael Burgess and Brad Moss over a stiff drum rhythm by Wynton Davis. Real nice! Bringing the pace (but not the heat) down, Show You Off has has a real nice swagger with a woven tapestry of guitar, drums and bass carrying the vocals on a chariot. With an increase in intensity as the track grows, the band is really getting the crowd sweaty. Lowell Folsom's Tramp, one of the great underrated tracks of our time fits nicely into the set. Shelly Thiss joins the band sharing lead vocals with Cecil and she has an excellent voice! She has a great weighted clarity like some of my favorite contemporary blues singers. This is an excellent demonstration of the bands capabilities both vocally and instrumentally! Gimme My Money is a real nice R&B style track in the Otis Redding flavor. Cecil is a great band leader with a super voice and this track is solid as a rock. Can of Gas & a Match is a real nice hill country style boogie. The band really gets would up on this one cranking out an excellent jam with acute dynamics. Frysumfish is a funky track that I'm certain has the crowd on it's feet. How funky you say?...Think Sly Stone! Kick Up Yo' Heels has a Tommy Tucker feel with a few hot guitar solos. Wrapping the release is Muddy Water's Mannish Boy, a 12 plus minute long jam with excellent guitar riffs and also featuring Pete Turpin on harp. This a sweet live performance by one of today's earthiest blues bands. Enjoy!